This morning the cloud cover was really low however, we still decided to head out to 2320 which is a mountain at the end of Glacier Col. Sam, Rob, Andy and myself left at 11am and didn’t get back to base till 7:30pm! It was a long but fun day including glaciers, summits, waterfalls, flood plains and a walk back along the beach with the surf crashing on the shoreline. We went up Glacier Col the normal way past Gull Lake and had lunch at the top. The snow has ablated dramatically. 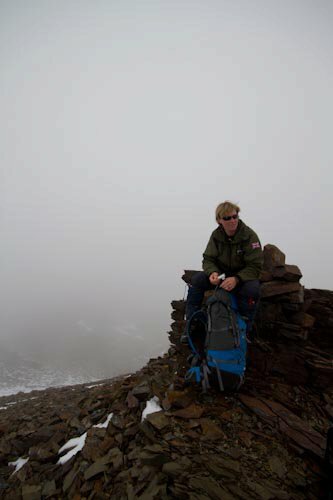 After lunch despite the low cloud cover we decided to continue on up to the summit of 2320. We decided not to go home the same way so took a valley down towards the Hamburg lakes. It turned into a steep sided gorge at some points with a beautiful waterfall cascading down to the lake. 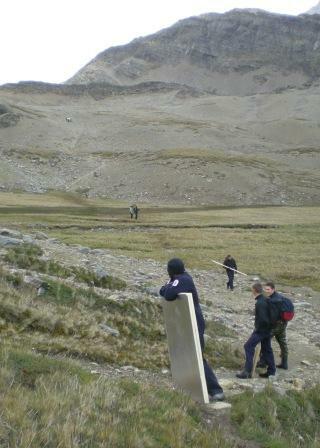 It took a while to pick our way down the valley to the side of the lake. Where we found some nice smooth rocks to skip across the still water of the lake. I managed to pick up a glacier pole here made from brass which will make my second wind chime out of. 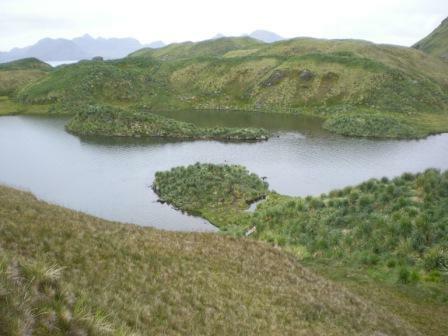 We continued along the side of the lake and onto a flat flood plain which after about an hours walk we got to Penguin River and the tussock along the shore line where there were a load of elephant seals, furries and King Penguins. The swell has been coming in all day and the waves on the shore were pretty large giving off a large amount of spray especially where it hit the wrecks at the enterance to the Morraine Fjord. The beach was covered in whale bones and beautiful large smooth stones. The Bremen a cruise ship was in however, Hugh who had run up to Glacier Col and back had made some brownies. 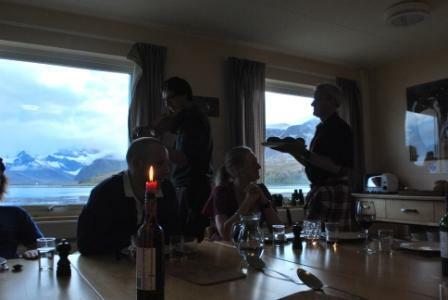 The museum folk had us in for some tea and brownie at Grytviken before heading back to base for some bangers and mash for dinner and a movie with Adam Sandler. Now it is off to bed. 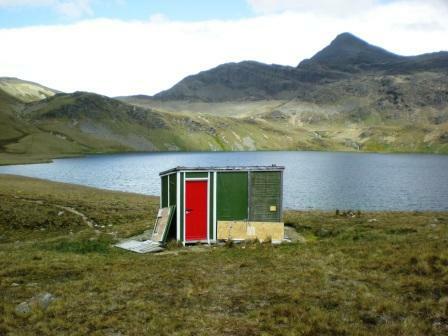 On Friday I was hoping to be left off at Harpon to get a coat of paint on the hut and stay the night. 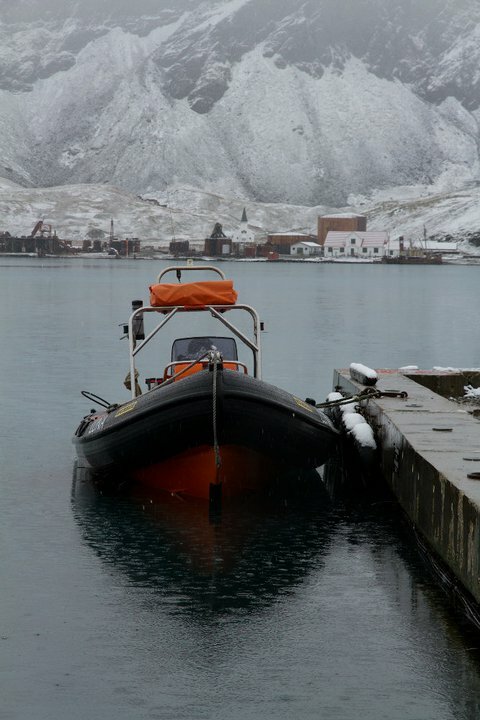 However, with work being done by tech services on our hyrdoelectric plant there wasn’t enough people to run the boats. So instead we went and picked up Kieron and Ruth at Carlita. It was a stunning day to be on the water and we had some fun on the way over there with the RIB jumping over the jet boats waves. 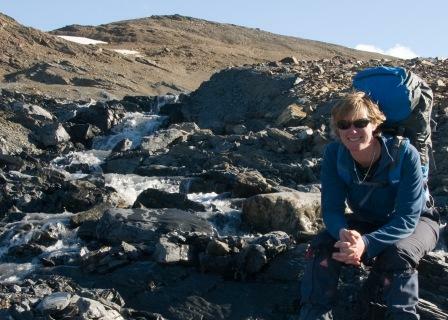 The picture by Sam above has 3320 (which we climbed a month ago) in the background rising above Lyell Glacier. After getting back Alastair and I headed did our scrub out duties and headed out to Maiviken to tag a seal with the GPS and try to get the seal that had evaded us on thrusday. After tagging the seal we went in search of seal number 29 and she was again sitting on the island in the middle of the lake. So this time I took my walking boots off and waded into the water with just my socks on as I didn’t want to have wet boots over night! Needless to say she jumped off the island when we got there and swam further down the lake. Determined to get her even though it was 6pm we trapsed through the tussock and found her sitting on a rock the other side of the lake taunting us. So we decided to call it a day and come back on Saturday. 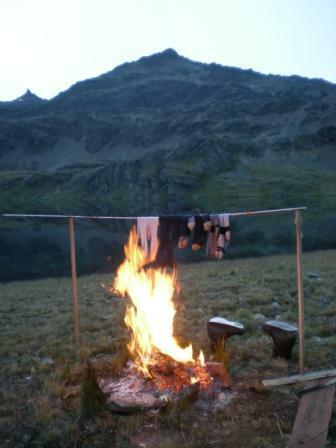 We went back to Maiviken hut and put dinner on the primus and Alastair got the camp fire going hanging up our socks to dry. 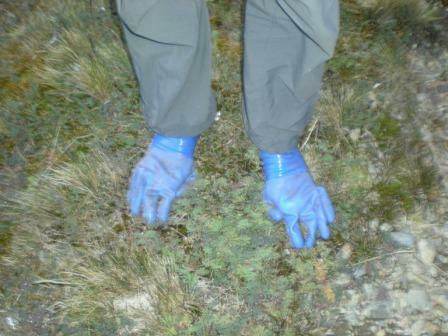 As Alastair had not taken his boots off to wade across to the island they were soaking wet so he resorted to gloves to keep his second pair of socks dry! I didn’t want to sit on the damp grass next to the fire so I made a bench out of the roof and sides of the old generator shed that was next to the hut and was not longer in use. This picture also shows the new panel we put in and the paint job on the hut that we did on saturday morning. Also in front of the hut is the bench I made on Friday night while the dinner was on the stove! On thursday we went with Alastair over to Maiviken to help him weigh 50 penguin chicks and also to see if we could recapture a seal with a GPS tag. We were meant to count the number of penguin chicks however, there was one group that was so large it was impossible so instead Sam took photos so Alastair could count them on a computer screen! After weighing the chicks we saw one of the seals with the GPS on the island in the middle of the lake so Alastair and I were about to wade out there when Tommy said what you doing that for there she is! Indeed there was another tagged seal about 100 yards from us on the shore. 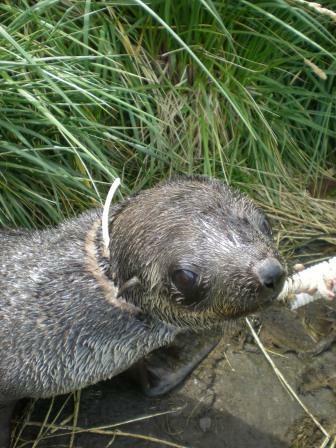 It was the seal that we had lost as her VHF tag had stopped transmitting. So we recaptured her and took off the faulty VHF and GPS and then the two of us waded up to our waist out to the island in the cold water. The second seal saw us and jumped into the water and swam away so we returned to the shore squelching. We had a productive day on base yesterday starting with a long boating trip followed by a short boating trip followed by a Burns Night dinner. After base meeting we loaded camping gear and rat boxes onto a jet boat and RIB. Just as we started out it started snowing with big large flakes and the visbility went down. 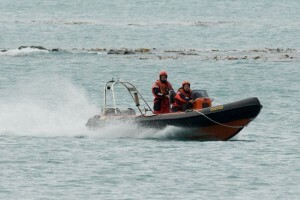 We also got a call from Katie that there was a banded seal outside the dining room so we tied the boat back up. As we were in our boatsuits we waded in to the water to stop the seal escaping to sea and corralled it to against Everson House. Needless to say the seal was quite uphappy. It was a piece of rope this time and it was not in the skin but was very tight. So back to the boats we stopped first at Poa Beach Maiviken and the guys set 10 rat traps along the tussock line in the bait boxes we had made. They also picked up some emergency food stashed in a sealers cave. Next stop was Curlew Cove where there is another very large sealers cave which had a lot of food. None of us had been their before so the RIB went in close along the shoreline looking for the cave. We continued along the coast to Harpon and went over the submerged morraine which got to 2.5m deep and inspected Harpon Hut. Again we removed food that wasn’t in a metal container measured the hut for a new door and figured out it needs a good paint! 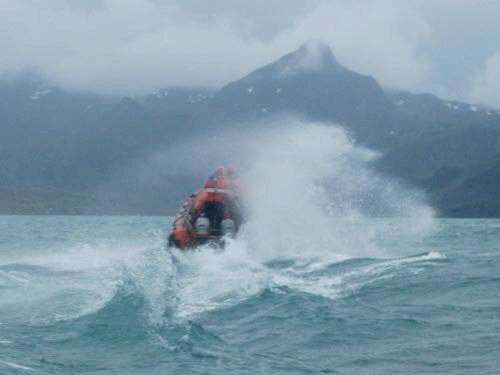 By then it was 1pm and the RIB party was getting cold so Sam transferred into the jet boat cab which had the heating going full blast. Last stop before returning home was Carlita to drop off Kieron and Ruth for a four day holiday. The hut there is beautiful and new but we aren’t allowed to stay on that Peninsula as BAS personnell. When we got back to base it was so flat calm we decided it was ideal weather for going to the Greene with another 10 rat boxes. 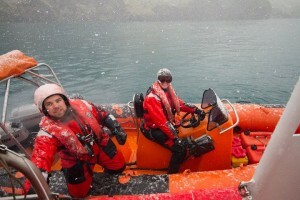 The water in the cove was slushy as it was covered in snow and there was 2 inches on the jet boat that had been left at base. It really looked beautiful which got Alastair started on Christmas tunes! As the rat boxes were half constructed Alastair and I banged in a few more nails and got 10 sorted before heading out again at 3:15. We got to the Greene pretty quickly so we split into two groups Alastair and Sam setting rat traps with myself and Mr Boat collecting bits that had broken away from the wrecks on the morraine – a lot of plastic pieces, electrical, polestyrene and we loaded the RIBs up. 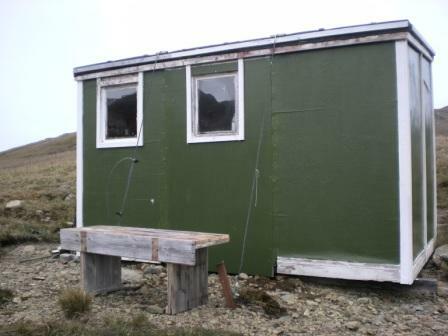 I also went to inspect the hut which needs a good lick of paint and some small jobs doing on it. We have to check the rat traps every 2 days so when the weather is good we will put some paint on the hut while we are over there and continue with the beach clean up. By the time we got home put the boats away clean up all the beach clean up rubbish and the food it was 6:30pm and time to get dressed in tarten for Burns Night. The light was absolutely stunning in the evening. We had the traditional meal with Pat acting as MC with a paint brush sporon and Rob playing his fiddle while the two walked around the table carrying the steaming haggis. I was on lates but couldn’t hack it as I was very tired after the last few days so I swapped with the Dr who took my lates and I have hers on Saturday night. 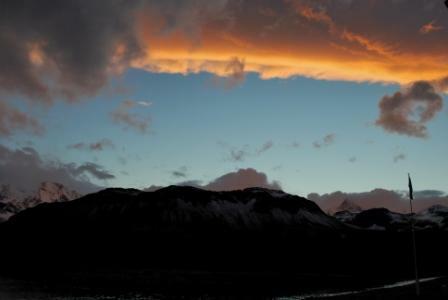 However, I did get a picture of the sunset before heading to bed. Today (wednesday) was a day off so everyone is doing laundry getting up late and of course the weather is awful however, Alastair and I are going over to Maiviken to see if the seal is in with it’s GPS tag and maybe we will do a thing or two in the hut! The not very pleasant weather broke on saturday and it was a very hot beautiful day. We went over to Maiviken with 6 VIPs off the RFA vessel to show them the pups in Evans Lake. Hugh, Alastair and I went ahead with Sam bringing the VIPs. 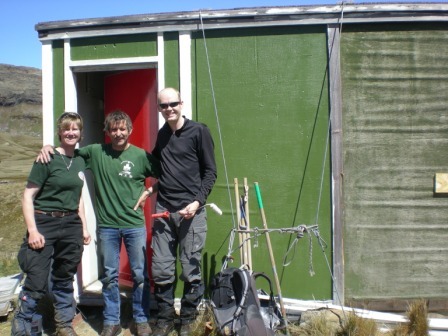 Hugh got some work done on the door (post box red), I got a coat of green paint on the hut and Alastair unfortunately was unsuccessful at finding the seal that we need to get a tag back from so he joined in with a bit of trip painting. 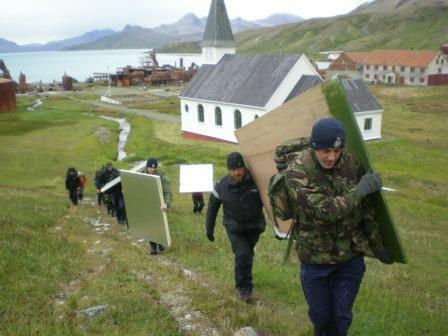 Thanks to the lads off the warship all the parts are now at Maiviken hut to do repairs. On the way up to Deadmans it started gusting 25 knots which with the insulation board in hand allowed us to be pulled up the slope by the wind. They started with a two man lift on the ply and ended with a four man lift – much more sensible. Now the small world part! One of the officers on the warship was a guy I sailed with in Dubai when I was 16 or 17. Him and his father invited me onto their Val 31 trimeran to race in the Presidents Cup after the boat I was on had a collision. It was one of the most fascinating races I have done. All these years later I didn’t recognise him but he thought it was me but didn’t say anything until he looked up my blog. The chances of meeting up in South Georgia after such a long time have to be very very slim indeed – I am not that good of a mathematician to work that out. Unfortunately he figured it out after he had been ashore for his ‘shore leave’ so we didn’t get to catch up. This post is copied from Rob Websters 365 photos. Leopard Seal Hauled Out, By The Nordenskiold Glacier12 / 365Early this morning a couple of RIBs crewed by myself, Ashley, Alastair, & Katie headed out to Sorling Valley on the Barff Peninsula to pick up part of a group of 17 soldiers that we had dropped off on Friday. 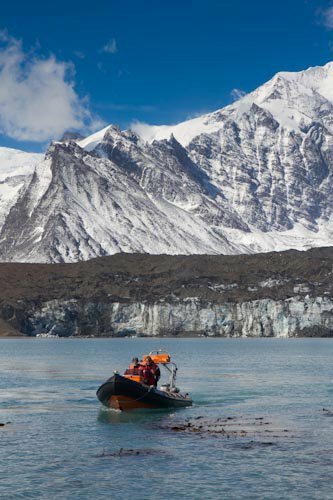 We had to wait about 20 mins for their helicopter to fly in and drop off their immersion suits and take their backpacks – we made the most of the time by having a look at the nearby Nordenskiold Glacier, one of the largest in the area. 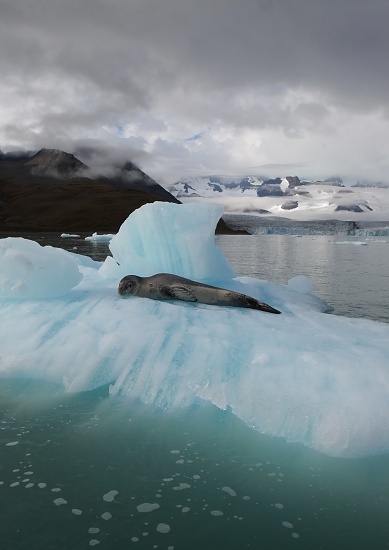 We were lucky enough to spot one of the elusive and formidable Leopard seals, enjoying a laze on a small berg. This is the first time i’ve had a good look at one of these beautiful and deadly creatures since i began coming to the polar regions, so it was extremely special. This sighting is very rare, and I’m over the luna to have gotten quite a number of good photos of it too. These photos will be sent to scientists monitoring the distribution of leopard seals around South Georgia and they should be able to identify it and see if it has been photographed before. We have been busy boating the last few days taking RFA back and forth from their ship and the next two days we will be doing the same with the Royal Navy. 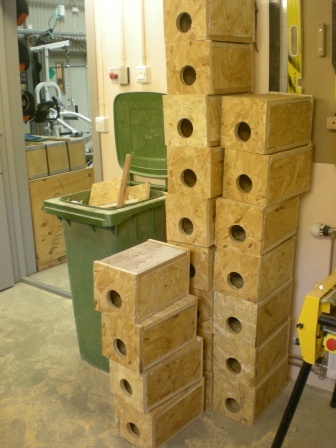 In the short periods between I have been busy in the wood shop making rat bait boxes. Tommy, Rob, Alastair and Kieron have joined in at various points to help out as well. 40 boxes to be made. The only reason we come to an animals rescue is if the injury is due to human interference such as a packing band around their neck etc. I hasten to add that when ever we get something like this on packaging in base we immediately cut in just in case it gets out of the waste disposal bags. 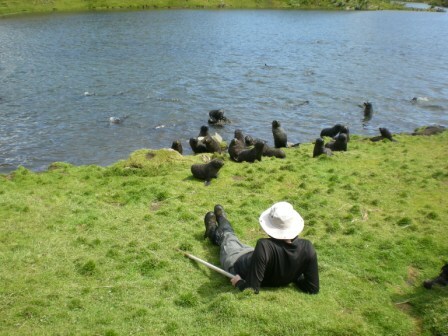 Sarah saw a widge (juvenile fur seal) with a band around it’s neck so she called Alastair. The two of us went out with a blade (to cut the band off) and a noose to hold the seal steady while cutting the band off. 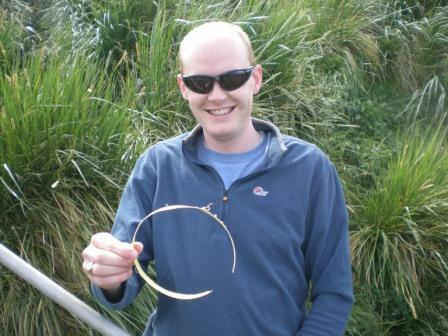 Alastair held the seal and I cut the noose it seemed to be a happier seal for it. 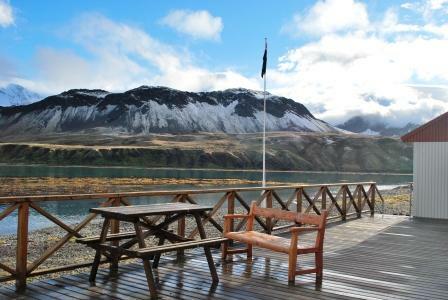 This morning we transfered 8 people to the Barff Peninsula for 3 days of camping for a visiting ship. This is a picture of Tommy driving and me holding on tight courtesy of Sam who was on the other RIB holding on tight as well!